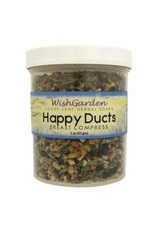 WishGarden Herbs' Happy Ducts is a soothing soak for vulnerable tissues. 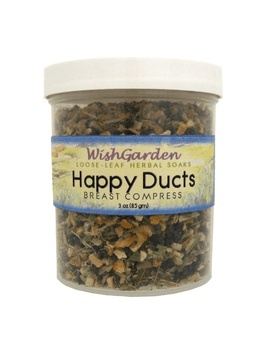 Happy Ducts Compress is a helpful external aid during lactation when lymph and immunity need extra support. Combine this compress with Happy Ducts tincture as a multi-strategy approach for healthy immunity. Intended for short-term use. Use as needed, although a minimum of 3-4 times per day is recommended. Place a handful of herbs into a clean cotton cloth, tie closed loosely and steep in simmering water for 10-15 minutes. Apply the hot, wet compress to the breast. The compress may be dipped back into the infusion periodically to keep it hot and potent. The leftover infused water may also be used by dipping in a clean cloth and using in a similar manner, called a fomentation.